The Bible tells us that, about 6,000 years ago, God made a world with no suffering, no thorns, no death, and no sin. It was a perfect world! On Day 6 God formed Adam and Eve and placed them in a garden. Genetic testing of the human Y-chromosome and mtDNA has confirmed that all people alive today are related to one man and one woman, whom scientists call “Y-chromosome Adam” and “Mitochondrial Eve”. Genetics and biology confirm that God created us male and female only a few thousand years ago. 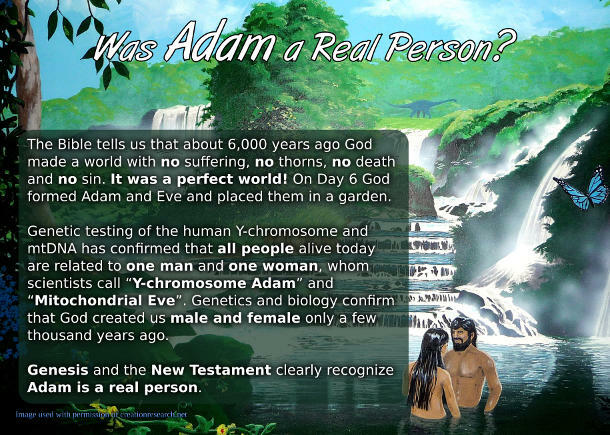 Genesis and the New Testament clearly recognize Adam is a real person. Christ had to come to give us life, because the first man Adam brought death into the world. "But of the tree of the knowledge of good and evil, thou shalt not eat of it..."
When God made the world He did not make people to die. The reason we die is because of sin. Every transgression of God’s law is sin (lying, stealing, adultery, lust, murder, hate, blasphemy). God is holy and demands that we too be holy. Just like Adam and Eve were punished for breaking God’s law, we too will be found guilty and must pay the consequence for sin in Hell. In Genesis God sacrificed animals to cover the sins of Adam and Eve, but about 4,000 years after the “first man Adam” sinned, the “Last Adam” would be sacrificed on a cross for the forgiveness of sins. 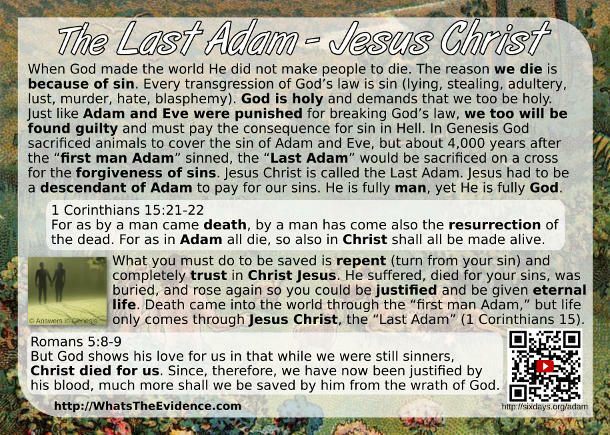 Jesus Christ is called the Last Adam. Jesus had to be a descendant of Adam to pay for our sins. He is fully man, yet He is fully God. 1 Corinthians 15:21-22 For since by man came death, by man came also the resurrection of the dead. For as in Adam all die, even so in Christ shall all be made alive. What you must do to be saved is repent (turn from your sin) and completely trust in Christ Jesus. 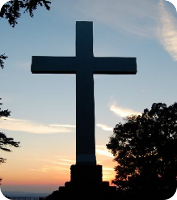 He suffered, died for your sins, was buried, and rose again so you could be justified and be given eternal life. Death came into the world through the “first man Adam,” but life only comes through Jesus Christ, the “Last Adam” (1 Corinthians 15). Romans 5:8-9 But God commendeth his love toward us, in that, while we were yet sinners, Christ died for us. Much more then, being now justified by his blood, we shall be saved from wrath through him. 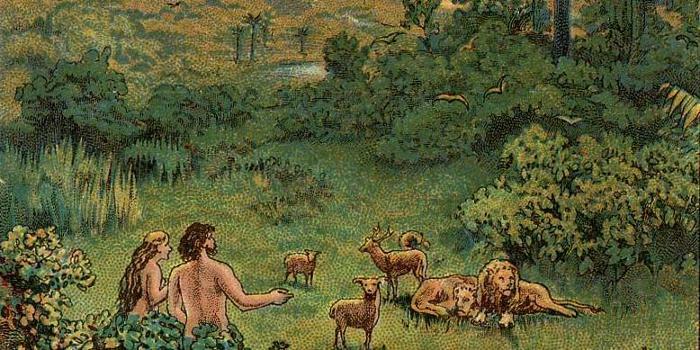 Was Adam real or a metaphor? Some people that believe the earth is millions of years old think Adam was not a real person that lived about 6,000 years ago like the genealogies in the Bible say, but they think he was a metaphorical representation of the first humans. 1 Corinthians 15 directly compares the physical body of Adam to the resurrected spiritual body of Christ. If you deny that the “first man Adam” did not have a literal “natural body” then the implication is that Jesus, “the last Adam”, did not have a “spiritual” resurrected body. And if Jesus did not raise from the dead then “your faith is vain; ye are yet in your sins” (v. 15). The concluding verse (v. 49) directly compares you to Adam by saying you have an “earthy” body now (just like Adam) but in the resurrection you will have a body like Christ. If Adam was just a myth or metaphor then this verse is false and you have no hope of a resurrected body. We all will die because of sin, but if you are a believer and you have put your faith and trust in the person and work of Jesus Christ then God has promised to make you alive again at his coming and the last enemy that shall be destroyed is death. If there was a real Christ then you can be sure there was a real Adam.